How do you describe your lab to visitors? We are dedicated to the research and design of technology that supports psychological well-being. Whether it’s mobile apps, VR, natural language processing, or social communications, we embed information from the well-being sciences into everything we do. To do so, we find ways in which tech design can support well-being determinants like autonomy, competence, relatedness, and compassion. Every week we come together and pass around a stuffed soccer ball. When you have the ball it’s your turn to share a five-minute summary of what you’ve been working on. Well-being goals, which target the improvement of some aspect of psychological well-being relevant to the project (e.g., improving a user’s sense of autonomy and competence in managing chronic illness, or increasing resilience among moderators of mental health forums). As seen on TV. Launching our asthma app for teens at a rock-climbing center. How many people are in the lab, and what is the mix of backgrounds and roles? We generally have about 15 people in the lab, the majority of whom are software engineers and HCI researchers. In addition to our director, Rafael Calvo, the team includes a creative leader, who is a user experience specialist and designer, two dedicated software developers, a couple of postdoctoral researchers in human-computer interaction, and a hardworking team of Ph.D. candidates carrying out research in areas such as virtual reality applications for healthcare, mobile apps for workplace well-being and work-life balance, and the use of computer vision for medical education. Well-being determinant cards used for brainstorming and ideation activities. Briefly describe a day in the life of your lab. On a typical day, a couple of us might head over to a local senior center to trial the latest version of our VR equipment with users. Some will video conference with psychiatrists at a national mental health organization to plan for a project on well-being in high-risk workplaces. Then we’d meet up for the weekly lab meeting and find out who’s gotten a paper accepted, who’s heading off to a conference, and who’s having a baby, all over lunch at the local Thai place. In the afternoon we might head out to run some co-design workshops with Indigenous youth, or pass interaction wireframes over to our software developers so they can start building our next app for adolescents with chronic illness. 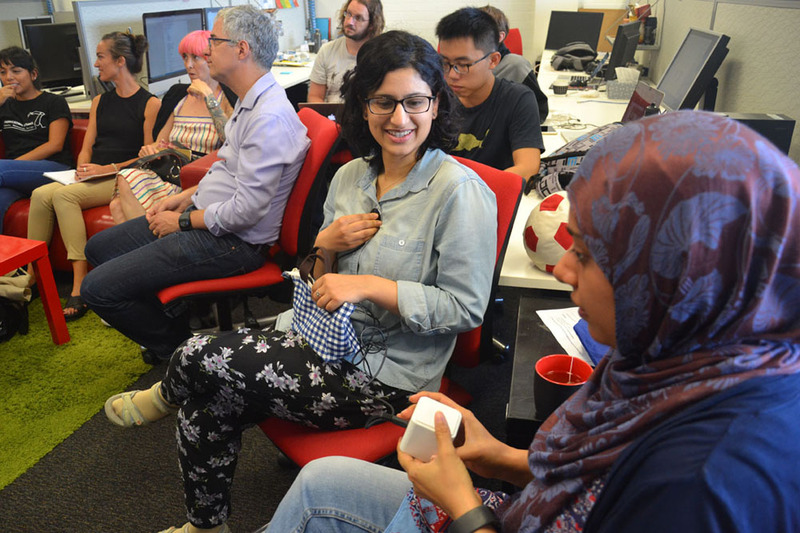 While our physical lab is our hub and we come together in person every Monday, for the rest of the week, we’re a diversely located bunch, collaborating with experts all over Sydney (and the world). So there’s plenty of video conferencing, digital collaboration, and moving around. A senior participant tests out a VR game for cognitive and cardiovascular exercise. How do people interact in your lab? One of the greatest achievements of the lab is the way we integrate deeply with experts in other disciplines. We work in close partnership (and meet weekly) with psychiatrists, psychologists, educators, and medical researchers in order to ensure that the well-being goals we set for our projects are research-based and evaluated with valid methods. Our director works hard to ensure that every member of the team feels involved in the bigger well-being picture and gains respect and understanding for the expertise and purpose brought to the projects by researchers in other fields. Fun with wires. Testing physiological signals for emotion tracking. What is the one thing you see as most important about the work you do there? We believe that any move toward a future in which technologies genuinely improve our lives requires that those technologies respect, and even foster, our psychological well-being. Our hope is that in the future all technology will be designed to support well-being. To that end, we work to bring psychology, ethics, philosophy, and well-being sciences into technology design. We want to help well-being-supportive design knowledge become part of the standard design process; we’re experimenting with and pioneering that process here. Our hope is that in the future all technology will be designed to support well-being. Our work is helping us all move toward a future in which all technologies genuinely contribute to human flourishing. Collaborators from architecture and design join the weekly meeting. The monk and the neuroscientist. We had the honor of receiving Dr. Jim Doty and the Ven. Bhante Mahinda, who shared their insights on compassion. Bedside manner. Helping medical students communicate better with patients.